International Interior Design Association’s Northern Pacific Chapter has awarded a Best In Category Award to the Shek-O residence in Hong Kong. Please see the Shek-O Residence page for more information on this projects, including credits. earlier this month in Seattle. The Northern Pacific Chapter of the International Interior Design Association hosted the awards. Jurors were Jody Pene of GBD Architects, Brian Graham of Brian Graham Design and Chris Bardt of 3SIX0 Architecture. NBBK Principal Chris Larson won an Honor Award for his career accomplishments and provocative approaches to conceiving interior space by integrating light, context, furnishings, art and other elements. TerrisDraheim Principal Terry Derry Draheim won the Industry Partner Award for this longtime role with the design community as a teacher, mentor and legislative advocate. Dong Il of Cornish College of the Arts and Katie Doyle won Wilsonart International scholarships. RESIDENTIAL: Olson Sundberg Kundig Allen designed the residential winner, a private Hong Kong villa on a rocky hillside overlooking the South China Sea. 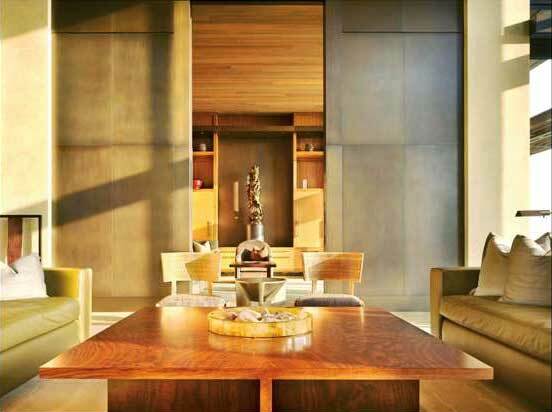 Interior finishes are concrete, locally sourced limestone, glass wood and bronze. The central space has 25-foot ceilings and is flanked by ore intimate seating and dining areas. The owner has most of the building materials and custom furniture shipped from Seattle. Craftspeople from the Pacific Northwest fabricated furnishings and finishes. Jim Olson was the design principal and Scott Allen of Scott Allen Architecture was the managing principal. William Franklin and Wing-Yee Leung were project managers. T.S. Chu Architects Ltd., was the local architect and PCS Structural Solutions was the structural engineer. Jim Olsen was the lead on the interior design, and Carline Fairchild was the project manager. Brianfield Limited was the contractor. Suyama Peterson Deguchi won an honorable mention for a private residence in Seattle’s Broadmoor neighborhood.